(Nanowerk News) The mercury found at very low concentrations in water is concentrated along the entire food chain, from algae via zooplankton to small fish and on to the largest fish — the ones we eat. Mercury causes severe and irreversible neurological disorders in people who have consumed highly contaminated fish. Whereas we know about the element’s extreme toxicity, what happens further down the food chain, all the way down to those microalgae that are the first level and the gateway for mercury? By employing molecular biology tools, a team of researchers from the University of Geneva (UNIGE), Switzerland, has addressed this question for the first time. The scientists measured the way mercury affects the gene expression of algae, even when its concentration in water is very low, comparable to European environmental protection standards. Find out more about the UNIGE research in Scientific Reports ("Cellular toxicity pathways of inorganic and methyl mercury in the green microalga Chlamydomonas reinhardtii IHg and MeHg impact in Chlamydomonas reinhardtii"). The UNIGE research team is led by Vera Slaveykova, professor of environmental biogeochemistry and ecotoxicology in the Department F.A. Forel for environmental and aquatic sciences, and vice-president of the School of Earth and environmental sciences, Faculty of Sciences of the UNIGE. 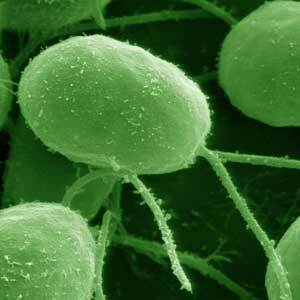 The scientists selected a green microalga measuring barely six microns by ten, known as Chlamydomonas reinhardtii. The alga was chosen not because of its colour or the two flagella it uses to swim but because, of all the primary producers in the aquatic environment at the the lowest level of the food chain of the food chain, it is the one whose genome has been fully sequenced. The availability of this genomic information made it possible to compare gene expression of algae exposed to different concentrations of mercury and to determine the associated effects. The researchers were able to analyse the transcriptome of the microalgae — i.e. the set of all RNA molecules that controls the expression of their genes — using molecular biology tools. And the conclusion was clear: mercury disrupted the metabolism of algae, with numerous genes being deregulated, regardless of whether the concentrations were comparable with those set by European environmental standards, lower or higher than those usually found in the environment. An alga that seems healthy from a physiological point of view appears altered when its gene’s expression is examined. The dysregulated genes are involved in diverse processes, from the generation of reactive oxygen species triggering antioxidant defence to the alteration of the flagella and cell motility. The photosynthesis and transport of essential elements such as zinc, iron or copper are also affected. It is difficult, however, to establish an exhaustive list since, as professor Slaveykova points out: “Of the 5,493 genes specifically dysregulated by methylmercury, we don’t yet know the function of 3,569 of them, even though this alga is the most widely studied of all the primary producers”. Together with inorganic mercury, methylmercury is one of two forms of the element analysed by the researchers. It is formed by the transformation of inorganic mercury caused by bacteria in the anoxic environment. It magnifies in the food chain and can directly affect the central nervous system of the top consumers.